Folk-influenced atmospheric black metal band Sojourner from Dunedin, New Zealand (including members from Malmö, Sweden and Bergamo, Italy) has revealed the first details and single from its upcoming second full-length album “The Shadowed Road“, scheduled for release on March 15th, 2018 via Avantgarde Music. Continuing in the tradition of “Empires of Ash“, the new album is forging the sound further outward in all directions. Mixed by Øystein G. Brun (Borknagar) at Crosound Studio in Norway and mastered by the legendary Dan Swanö at Unisound AB in Sweden, the production on “The Shadowed Road” perfectly captures the sound that the band has been striving for since its beginning. Guest lyrics on the song “Titan” were written by Anders Jacobsson (Draconian). For the artwork the band commissioned the incredibly talented Romanian artist Bast, who has created both the beautiful album cover, alongside several interior pieces that can be found in the physical editions. “The Shadowed Road” will be available in CD, vinyl, and cassette versions. CD will be available in a single, high-quality hardback digibook edition; vinyl will be available in both black and royal blue; and the cassette editions will come with a bonus booklet and band logo sticker. Early pre-orders are open through Avantgarde Music’s Big Cartel & Bandcamp pages. The album will also be available for pre-order directly from the band both digitally and physically, beginning Friday the 9th of February 2018. 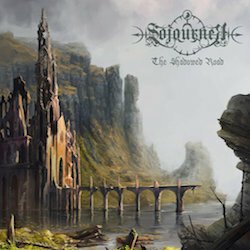 Sojourner have also released the first single (and opening track of the album), entitled “Winter’s Slumber“, that you can listen to below.